If you want to ditch cable without losing the cable DVR experience—warts and all—the TiVo Roamio OTA is your answer. TiVo’s $400 DVR for over-the-air channels has all the creature comforts of a cable box, from the traditional channel grid and button-packed remote control to the seemingly limitless recording options for TV shows and movies. And like TiVo’s own cable boxes, it comes with some powerful ad-skipping features. But TiVo’s old-school approach to recording broadcasts from an antenna also brings some baggage. It’s easy to get lost in the Roamio OTA’s labyrinthine menus, or forget what button you’re supposed to press. And while TiVo tries to be a complete cord-cutting solution with both over-the-air and streaming video, its options for the latter can’t compete with dedicated streaming boxes like Roku, Amazon Fire TV, Apple TV, and Nvidia Shield TV. 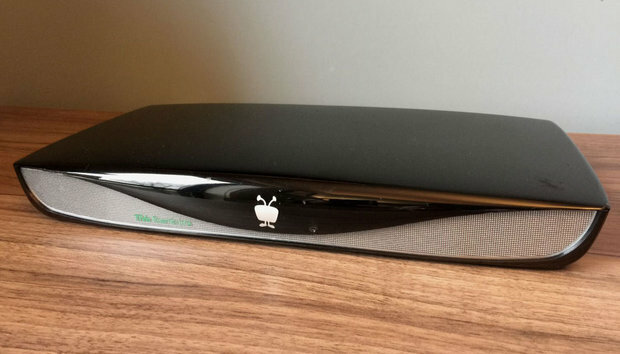 The TiVo Roamio OTA is a hulking piece of creaky plastic, more like a cable box than a modern streaming device. Around back, there’s an HDMI output, an optical audio jack for connecting to older sound systems, and, quizzically, a couple USB ports whose only purpose is to charge other devices (external USB storage is not supported). You supply your own antenna, which plugs into the Roamio OTA’s coaxial input. If you want to expand the Roamio OTA's storage, you'll need to replace its existing internal drive. The USB ports are only good for charging devices and the only compatible e-SATA drive was discontinued. Inside, the box has 1TB of storage—good for about 150 hours of HD programming—and four tuners, so you can watch or record four programs at once. The internal drive is replaceable, but while the Roamio OTA technically allows external storage via a rear e-SATA port, the only supported drive is WD’s DVR Extender, which is no longer manufactured or sold. 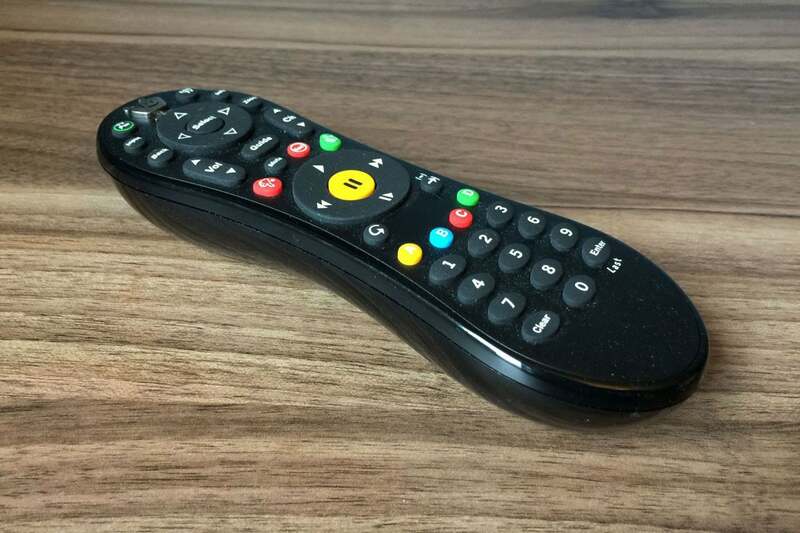 Equally cable-like is TiVo’s remote control, a hefty implement with more than 40 buttons for changing channels, controlling the TV, controlling playback, and navigating through the TiVo Guide. Having almost every conceivable function just a button press away makes some sense, but it’s going to create whiplash for anyone who’s used to streaming remotes, with their minimalist designs, contextual on-screen menus, and voice search. The remote does, however, have some welcome departures from cable boxes: It uses an RF signal to control the TiVo—no line-of-sight required—but still includes an IR blaster for your television’s volume, power, and input. Best of all, it lets you easily skip advertisements. Pressing up or the green “D” button during commercials automatically takes you to the end of the break on certain programs, and there’s also a dedicated button for jumping ahead by 30 seconds. TiVo's remote is loaded with buttons. On the bright side, it has both RF and infrared transmitters. 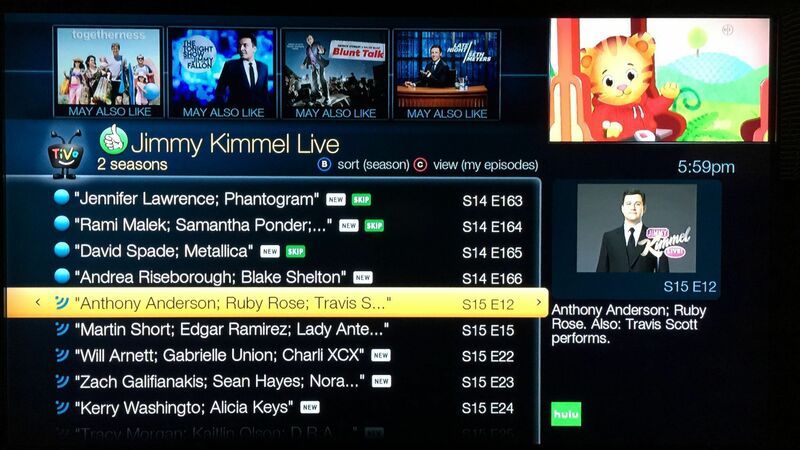 TiVo used to charge for DVR service, but now it’s included in the $400 price. That’s a lot to pay up front, but in the long run it beats paying TiVo’s old $15-per-month service charge. In terms of raw capabilities, the TiVo Roamio OTA offers an impressive amount of granular controls. When setting up a series recording—a “OnePass” in TiVo lingo—you can record just new airings, limit recordings to a specific channel, record in HD only, record in SD only, keep only recent recordings, keep recordings only until you run out space, and add buffer time on either end of the recording. 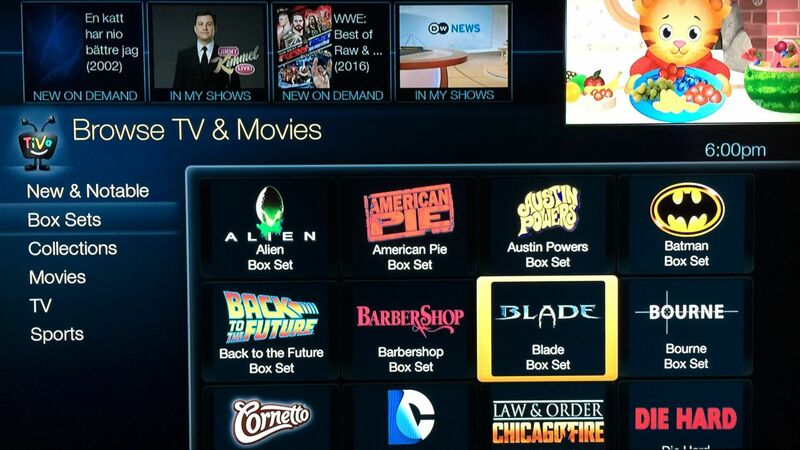 Through TiVo’s “WishList” section, you can even program recordings for a specific actor, director, category, or keyword. TiVo also pulls TV episodes from various streaming services into OnePass, so if a show is on Netflix, Amazon Prime, or Hulu, it’ll show up in the same list as your over-the-air recordings. The feature will likely be most beneficial to Hulu subscribers, given that service’s emphasis on network television. With Netflix and Amazon, you may find that there’s not much overlap between recorded and streaming series. TiVo's channel guide offers impressively granular control over what you want to watch now and record for later. Use TiVo enough, and the system will even start automatically recording programs that it thinks you’ll like. You’re still in charge of fine-tuning the suggestion algorithms by giving thumbs up or down to whatever you’re watching, but being able to populate the DVR without programming everything manually is a nice way to feel like you’re getting your money’s worth. 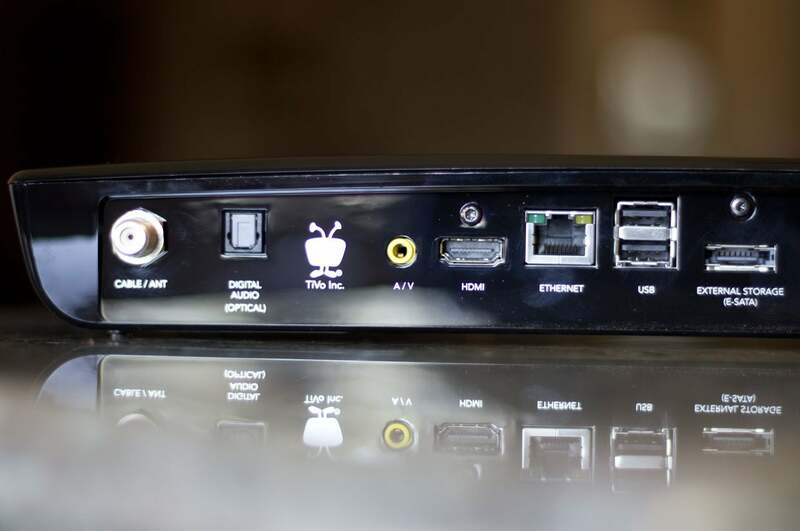 Where TiVo falters is in helping users make sense of its many features. The TiVo Roamio OTA is overwrought with menus that are redundant or of dubious utility, including two separate menus for launching apps, two areas for browsing live TV, and a recommendations row on the main menu that rarely seems relevant. There’s also a menu full of curated movie and TV show “collections,” but TiVo doesn’t label the sources for this content up front, and in many cases the selections are only for rental or purchase. The whole interface could use a complete overhaul. One is supposedly coming this year, but we’ve yet to see how that redesign works on a day-to-day basis. TiVo's curated "collections" don't indicate where the content is coming from, so you won't know if it's included in a service you already have or if you'll need to pay more to access it. Those issues aside, the TiVo Roamio OTA is also missing some benefits you’d get with other over-the-air DVR solutions. Its app selection, for instance, is dismal compared to dedicated streaming boxes. New streaming bundles such as Sling TV, PlayStation Vue, and DirecTV Now are absent, and the only TV Everywhere apps are HBO Go and Epix. New streaming services like SeeSo, Pluto.TV, and Filmstruck aren’t available either. The apps that do exist also seem slower than their streaming box counterparts, especially those that come from the Opera TV app store. Don’t expect TiVo to serve all your streaming needs unless they’re fairly basic. And unlike OTA DVR products from Tablo, HDHomeRun, and Plex, TiVo can’t stream your recordings onto other connected devices, at least not without additional hardware. Watching TV on your phone or tablet requires a $130 TiVo Stream box, and watching on other televisions requires a $150 TiVo Mini, raising the cost considerably if you want a whole-home or out-of-home solution. The TiVo Roamio OTA is still worthwhile for folks who want a powerful DVR solution, but don’t want to deal with the vagaries of streaming. With four tuners, ample recording options, and helpful ad-skipping features, TiVo’s over-the-air DVR excels at squeezing every bit of value out of your antenna signal. It’s just hard to shake the feeling that its best days are behind it.